This book is filled with information and given in a way to make you remember. It helps with all those grammatical questions you may be wondering about. Mrs. Grammar Person reminds us of being weary of relying on things such as spell check (i.e. morning vs. mourning – huge difference!) There are many tidbits such as this throughout the book. 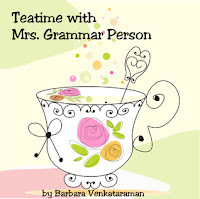 The presentation is very pleasant and enjoyable, which isn’t usually true for a grammar book. I listened to this one in my car. It’s the perfect audio book. I felt as if the narrator was in the car and we were having a conversation, not just being taught about grammar. It’s a quick book to listen to…I finished in one day. This is a very cute way to learn important information. What fun! And definitely better than Spell-check, I'm sure. Thanks for sharing. Any grammar book described as cute and fun is worth a look, especially if it makes looking up or learning points of grammar easier. I read another book by her and really enjoyed it. I think I actually have a copy of this one as well. Any grammar book that can be considered fun is definitely worth reading!